ظهر العملة سفينة نوح - تصوير حمامة تحمل غصن الزيتون أمام تابوت في مياه جارفة، مع جبل أرارات والشمس في الخلفية. سفينة نوح - تصوير حمامة تحمل غصن الزيتون أمام تابوت في مياه جارفة، مع جبل أرارات والشمس في الخلفية. 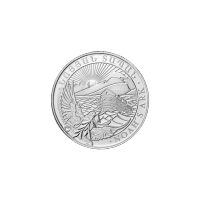 1/4oz 2014 Armenian Noah's Ark Silver Coin The obverse of this coin depicts a dove carrying an olive branch in front of the Ark in flood waters, with the Mount Ararat and sun in the back. The reverse shows the Armenian Coat of Arms, official name of Armenia in both English and Armenian (Republic of Armenia), legal tender, weigh, purity and metal type, and a hallmark of the Leipzig Mint where this coin is minted. This beautiful, intricately detailed silver coin makes the perfect addition to any silver collection.